Posted December 20, 2017 • filed under News, Research. It’s December, midway through my Fulbright year in Bergen, Norway. My wife, digital artist Alinta Krauth and I live on the third floor of a mansion. It’s a stately building landed on a high hump between mountains and waterways and owned by the University of Bergen. The building is, like the rest of Norway’s confusedly beautiful world, a place of contrasts, fast swinging leaps between aesthetics and care. 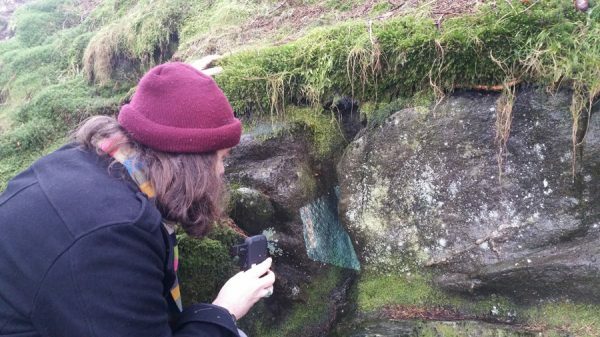 Much of Bergen is held straight against the slopes by rock walls, and these collections of stones, boulders and gravity are fascinating and disturbing in equal measure. Walking beneath them feels dangerous, you are relying on luck to keep the misshapen structures from falling into the street. 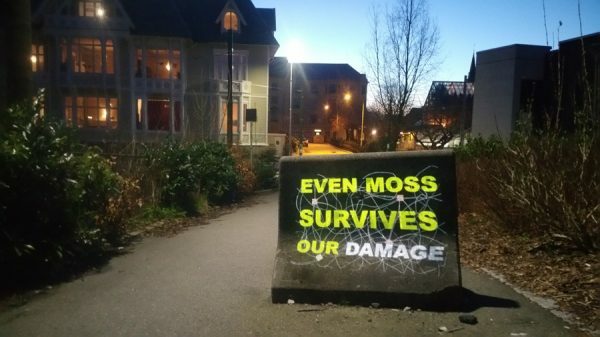 Behind our mansion home is such a wall, and in the brief December afternoon I am experimenting with projected text, aiming light on the varied surfaces to create a cartography of moss and poetry. Our backyard rock wall is the perfect place for geometric text placement. As I sweep across the irregular stones I notice an unexpected glistening, evidence of treasures between. Exploring closer I realise the objects reflecting light are syringes. As if following a drug derived algorithm, there are a dozen carefully placed injecting devices, every third rock up and fourth rock down. And with each, the needle points inwards, markers for some past mystery buried in the crevasses. The junkies of Bergen are careful with their dangerous refuge. And it was these stories, this layering of experience we attempted to recreate in our projected and animated poetry. The magic trick is to create textual wonders that engage with the physical surface of a rock wall, or a pile of leaves, adjusting the colours and textures of the artwork to contrast with the natural tones and irregular intersections. And also to write content that adds to those historical layers, reveals some future/past or fictional/poetic other-land. 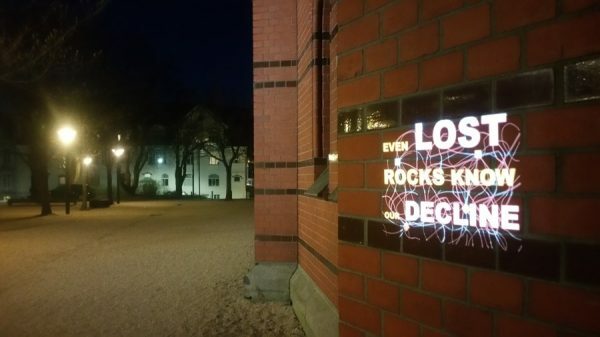 An animated poem projected brightly on the dark steel of a dumpster has quite a different meaning than the same pome projected on the tall white door of a gothic church. We are rushing through the city centre, pulling suitcases filled with electric bits, projectors, cords, computers and gadgets. Nothing about our route is smooth or straight, between a network of puddles and disagreeable sidewalks, we arrive at the funicular station body sore under a sky of deep, low clouds. Ever since arriving in September during the season of 2am sunlight my goal has been to project giant poetic text from Mt. Floyen’s summit, large enough for those meandering in town to notice, squint and ponder. 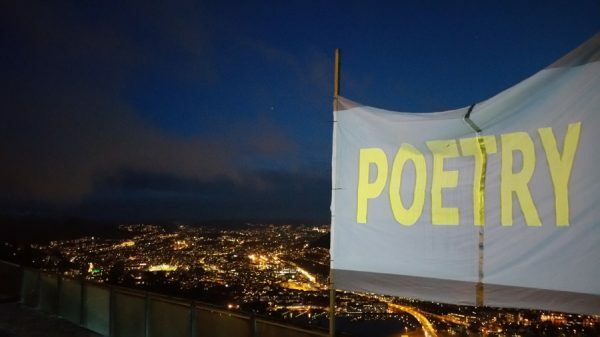 I use poles cut from found wood, and shower curtains with weather holes, tied together and then loosely to the railings to make up a haphazard projection screen overlooking Bergen city. Nearly a quarter kilometre of power cords snake to my projector, held barely safe on a plastic table. I’ve finished testing and am ready to send two word messages to the evening traffic below, when it starts to snow. Building poetic creatures within the safe walls and for the expected audience of a gallery is an aseptic experience. Technology generally works, walls are predictably sterile and the didactic panel screams meaning to creations untethered from the world. 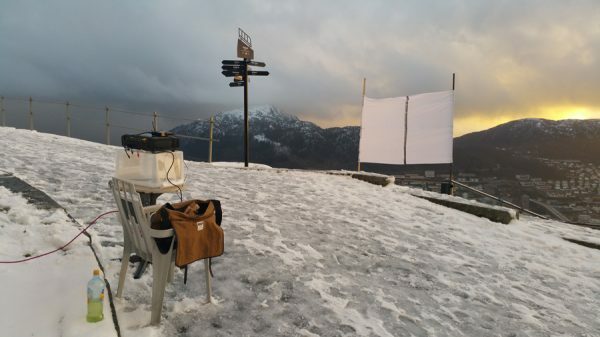 However, projecting poetry from a mountain cliff, overlooking a historic city, while heavy snow builds around you with a broken umbrella shielding the light shooting electrics is an adventure into intersecting sensory trajectories. The power of projecting through the mountain snow makes even simple texts seem more beautiful than they deserve. Prior to my Fulbright year in Norway, I coveted inclusion in the annual Piksel Festival in Bergen. When my work was accepted, I imagined droves of Norwegians standing in lines waiting to explore my work in some beautiful and yet slightly gritty location. So, after the nine-month process of peer-reviews, forms, interviews, judgements and testing and background exploring was over and I was officially offered the fellowship, one of my first tasks was to apply for Piksel. After both Alinta and I had work accepted into the Festival, we excitedly prepared and spent giant sums in shipping our installations across the world. As the exhibition date grew close our excitement grew as the venue was a multi-story industrial warehouse perched at the edge of the bay, reached by a charming old ferry boat for participants and visitors. That excitement dimmed daily during the days and weeks of installation, the exhibition and then de-install. Curiously, while the venue oozed industrial charm, the organization of the exhibition was oddly lacking. It was common for us to arrive during the exhibition’s opening hours and all the doors were closed and locked. And most days we took on the unofficial responsibility of finding a maintenance worker to open the building. My digital poetry work, The Impossible Box, looked amazing in a large industrial room four stories up, it’s just that few people could reach it. Norway is dotted with these strange contradictions. There is funding and support for the arts. There are beautiful venues and overflowing opportunities for showing/sharing and creating digital art. And yet some of these exhibitions that look amazing in documentation photos were also seemingly uninterested in attracting readers/users/visitors. Or, as in the case of Piksel, they spent considerable time and money promoting the event, but then forgot to direct someone to open the doors to even enter the building. Discussing digital projects with those whose experience with electronic art extends no further than a screen saver is an exercise in translation. Digital writers speak languages, use terminologies, even understand the spatial screen/landscape quite divergently from others. And as such communicating the how and what and why of a proposed digital creature is often hindered by language gaps. Combine that with native tongue differences and simply starting a new project is a long and awkward conversation. To make these discussions easier, digital writers have a cheat-sheet in the back of their brain, a long list of synonyms, analogies and metaphors, used to explain the magic of the artistic electric. Luckily, when negotiating with the University of Bergen Library, we had an Aud. An Aud is a librarian who is tri-lingual. She speaks English, Norwegian and Digital Artist/Writer. So as we built our large artwork in the glass box hovering over the library foyer, Aud translated our needs, desires and requests to the university bureaucracy. And then, knowing we wouldn’t understand Nowergian Librarian speak, translated the bureaucratic demands and forms and requirements back to us. And almost always did that with a cinnamon roll and instant coffee. Above the university library’s foyer with students collapsed into chairs, over tables, submerged into couches warmer than the wintery outside, is a glass boxed room. On the windows we’ve taped as many translucent shower curtains as could be delivered via the post. Behind them are aging projectors, offered to us from the back room of a university warehouse where coma-soon technology goes to never wake. 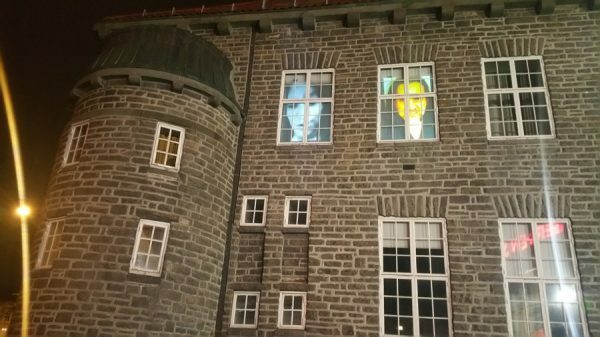 The artworks we create, projected on a 20-metre surface, split over a right angle, are designed to change and adjust over time. As the library is our host, and all those who enter are in search of ideas and stories and information (and warmth during the winter), our creations are all derived from library materials. My digital poetry, comprised of texts which build and grow, then fall away to build again to form short poems, are poetic narratives inspired by items from their collection. The hope is someone can watch our creations, fall asleep on a couch and awake a few hours later to a new digital artwork/poem. A few months later we discovered something kind-of wonderful. The library extended the duration of our giant glass box works from a month to 45 days to over two months. And evidently during this time our digital writing morphed from a background display to a living creature, an alive experience students and staff expected to see and absorb daily. So when we finally took down the screens, unplugged the computers and projectors, there was a palpable concern. Many expressed remorse at the hole in their ambient existence. The artwork had become a kind of companion, a moving and dynamically changing counterpart to the heavy institutional architecture surrounding them. Our digital artworks and poems were no longer owned by us, the artist and writer was dissolved. And instead the artwork and its electric light, its handmade aesthetic and borrowed and ramshackle tech, was born into the world, an entity unto itself.